The events began Sunday [July 19, 2015] morning around 10 AM when the Mexican Army conducted an operation to arrest the leader of local autodefensas group, Semeí Verdía, in the village of La Placita. The Army appeared at the same time at El Duin and Xayakalan, sites where the community police forces maintain checkpoints. According to testimonies collected by La Jornada Michoacán, the Army then ran their vehicles into the checkpoints, opened fire and attempted to detain several people. At the time of publishing it is unknown how many were detained or their names. In the actions in El Duin and Xayakalan, Army members had no arrest warrants and crimes against those who were detained are unknown. Subsequently, around 11 AM another group of Army personnel arrested members of the Commissariat of Communal Goods of Santa Maria Ostula, again without presenting arrest warrants and acting violently. Semeí Verdía has been charged with possession of firearms and explosives used exclusively by the Mexican Army. He is facing an additional charge of destroying ballot boxes. Verdía is first commander of the community police force of the indigenous community of Santa Maria Ostula and General Coordinator of the AUC in the municipalities of Aquila, Coahuayana and Chinicuila. After Verdía was detained, community members began to peacefully demonstrate and tried to march to the municipal seat of Aquila located about 1 hour away. 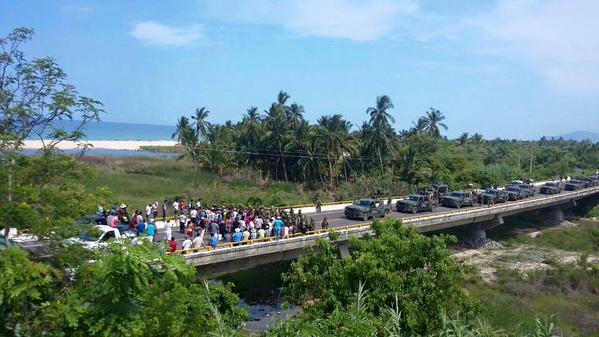 During the march, the Mexican Army blocked the way of the protesters and opened fire on the demonstrators. Quadratin spoke via telephone with people involved who relayed that about 300 protesters demanded the Army release Semeí Verdía. The Army then opened fire on the demonstrators, broke through the block and proceeded to fire on houses and restaurants where presumably several injuries occurred. Community members arrived at Hospital Coahuayana around 6 PM with the bodies of three wounded and one deceased all by bullets: Christian Melesio – age 60, Neymi Natalli Pineda Reyes – age 6 and Antonio Alejo Ramos, 17 years old were injured. Heriberto Reyes García, approximately 12 years of age was killed. Semeí Verdía was previously targeted by local cartel, Caballeros Templarios working in collusion with the former mayor of Aquila. 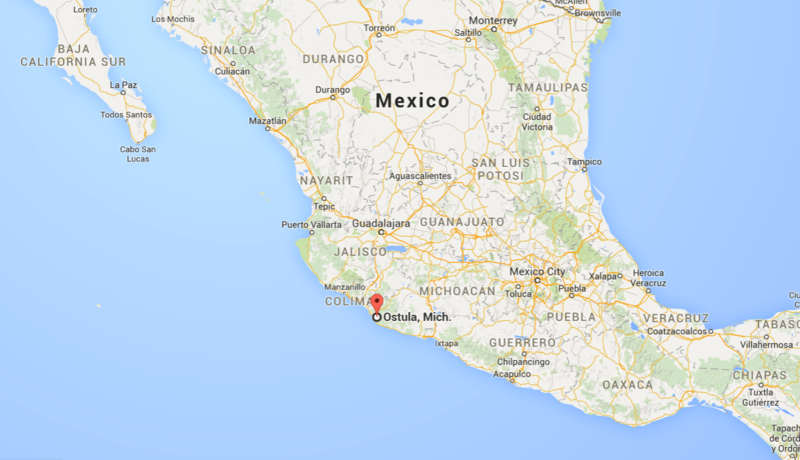 On May 30, state police arrested Juan Hernandez, mayor of Aquila, who was accused of planning attacks on Shimei Verdía by orders of Federico González Medina “The Lico” main boss of the Caballeros Templarios in the region. The former PRI mayor was charged with aggravated homicide and attempted cover-up. 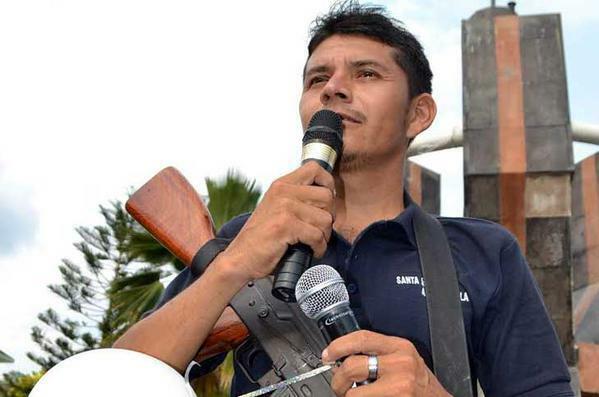 The leader of the autodefensas of Huahua, José Antioco Calvillo García reported on the movements of Semeí Verdía to Juan Hernandez who in return paid him money. It was reported that the mayor offered $2 million pesos to a criminal group to kill Semeí Verdía. Juan Hernandez had met with “La Tuta” in 2013 and agreed to allow drug traffickers to exploit the iron mines of the region, from which they extracted thousands of tonnes of ore which were exported illegally to China, through the international Michoacan port of Lazaro Cardenas, activity in which Verdía was seen as an obstacle. Here is a short video, the people of Ostula describe frequent disappearances, fear and general insecurity felt by their community before the autodefensas came to protect them. 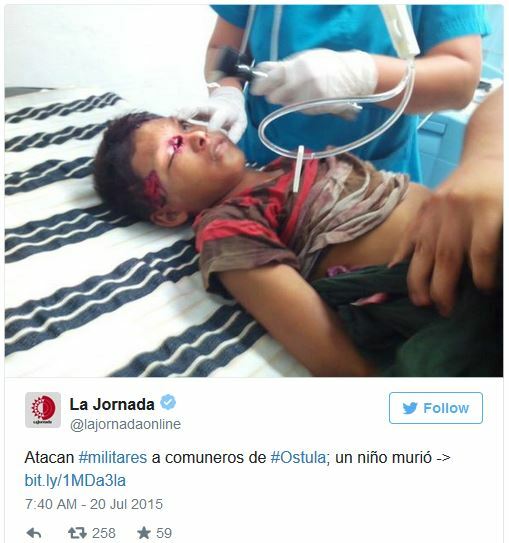 Posted on July 20, 2015, in Defending Territory and tagged autodefensas, Mexico, Mexico Indigenous, Ostula, Self Defence Groups, Semeí Verdía. Bookmark the permalink. Leave a comment.